Thank you for all the comments on my last post! I was thinking about it, and I probably won't end up doing the look when I go out, it's not really me hehe. I also don't really take full face pictures because I'm usually in a rush to leave when I'm done my makeup...or I'm either bored at home and just decided to play with eye makeup without foundation. Anyway, if you're a student like me, you're probably poor and can't afford to spend money if it's not necessary. So..when the spring collections rolled out, it was hard not to get anything! 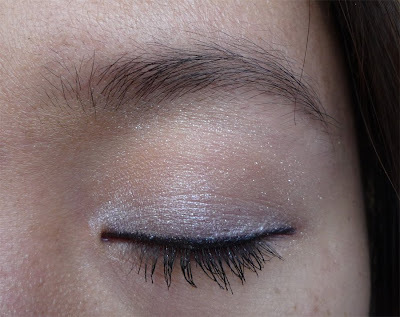 Rather than spending the money to buy more makeup, I used what I had. I really liked the new Maquillage VI767 palette and I was able to find shades that were similar to those in it. For more info and pictures, check out Lotus Palace's review. I used Kathi's pictures as a reference for the colours and this is what I came up with. I think it's pretty close to the palette judging by her swatches. 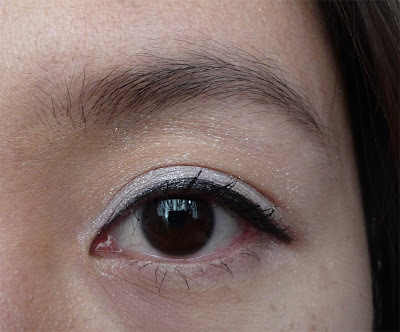 I also used Kathi's eotd (thanks!!!) as a guide to how to apply it. I tried applying the shadows the way the website had it, but it didn't turn out nicely. 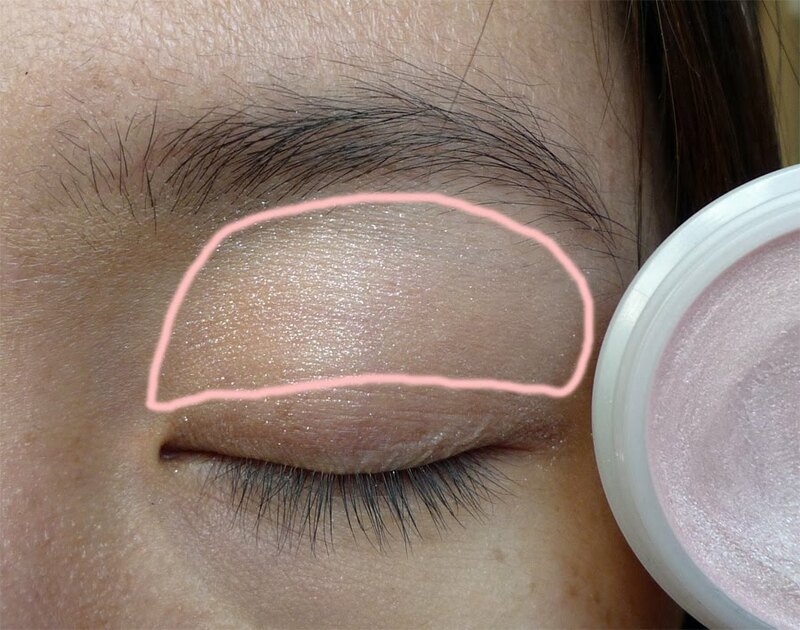 First using the pinkish cream highlighter shade..which doesn't show up pink at all, but I just didn't want a white highlighter. 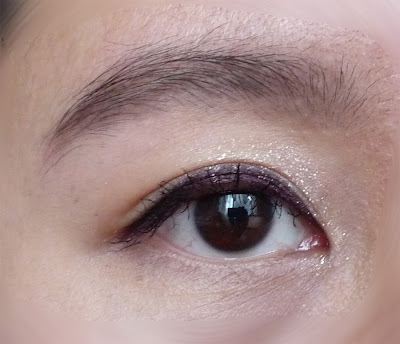 Next, purple cream shadow up to the crease, making sure not to go beyond that, otherwise blending is a pain. 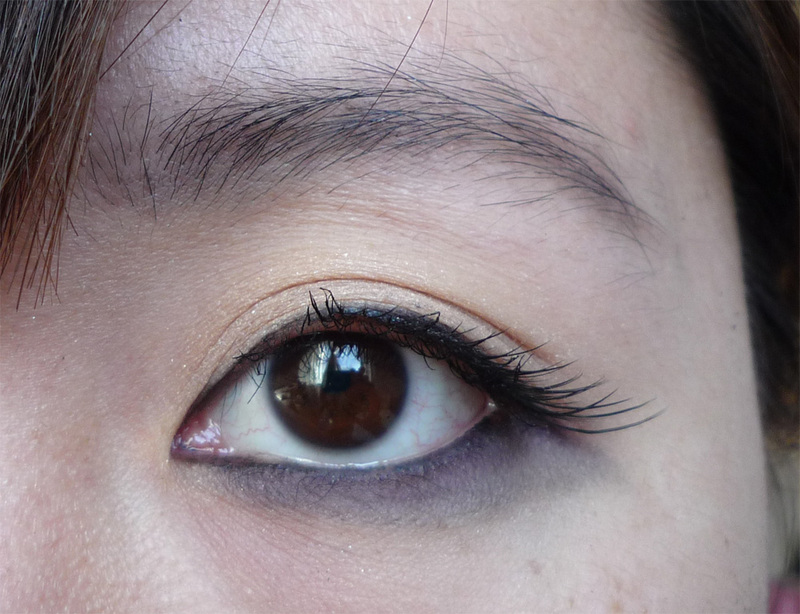 Using the light brown shade from GY865 in the crease. 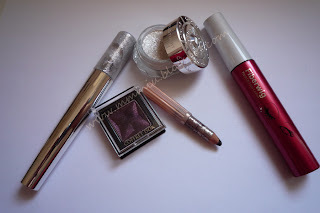 Applying more purple shadow if necessary. 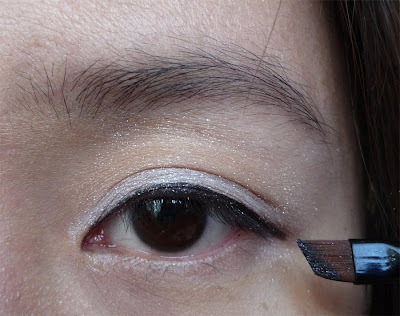 I lined with the cream liner, extending it out a bit. It wasn't dark enough so I went over it with the MM liner. Finished! I really like this, I'm probably going to do this for school tomorrow. Hi hello everyone. 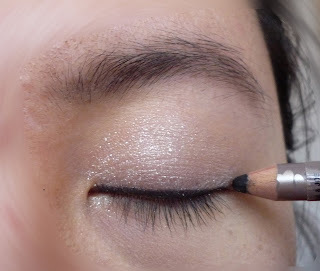 It's such a beautiful sunny day so I've decided to do another picture tutorial. As you may have already guessed by the title, it's an upside down shadow look, but smokey. It's very simple, as long as you have 2 shades of grey, 1 dark and 1 light. Start by applying the beige shade all over the lid. 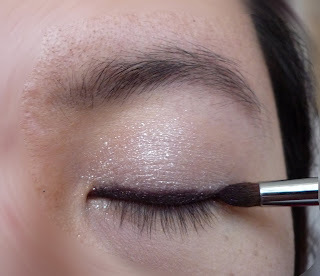 It gives the look a subtle shimmer on the top and I also think it balances out the amount of shadow on the bottom. Tight line all the way to the inner corners, line the waterline, and very lightly line the top lashline. 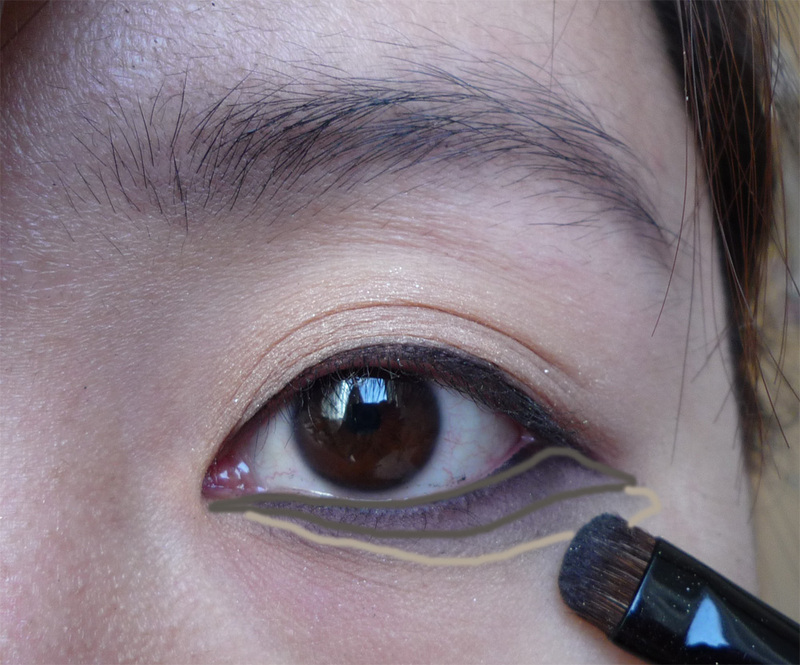 Extend the liner out a little. I like using the Integrate liner for this, I find that regular pencil liners don't make a line that's thin enough. Smudge the dark shape first from the inner corner out, making it thicker as you shade out and extend it out a bit, blending the liner. 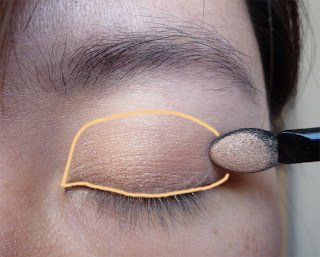 Make sure you smudge enough so you can't see the line from the liner. 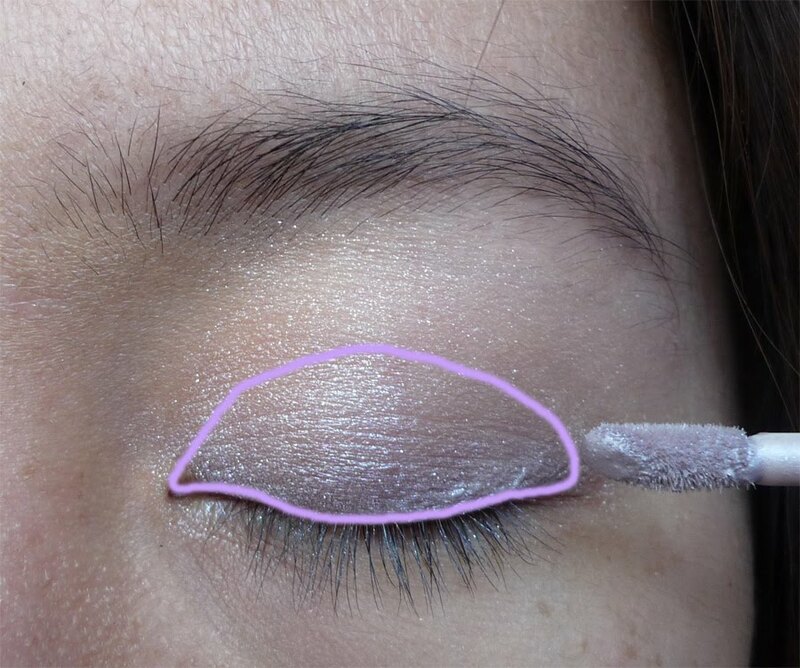 Next, blend the light grey under the darker shadow and also make it thicker as you blend out. 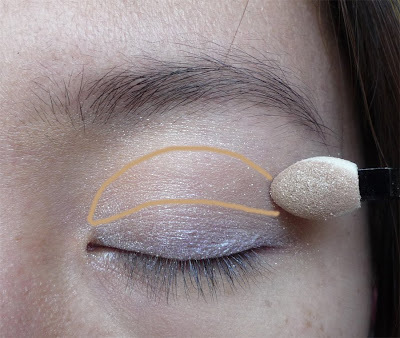 Notice the shape of the shadow, it's kind of like a thick winged eyeliner, but with shadow. Finish off with mascara and false end lashes and voila! Piece of cake. 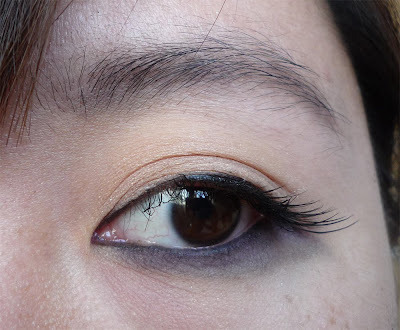 I don't apply mascara on the bottom because I think it takes the focus off the smoky shadow. This is probably the boldest look I would do, hmm..maybe I should wear it out more often. 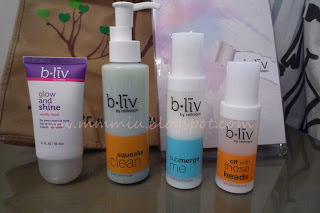 A few weeks back, Selina from the B•liv (pronounced "believe") asked me if I could do a review on the products. I thought it would be sample packs so I was pleasantly surprised that these were full sized products. Thank you Selina! 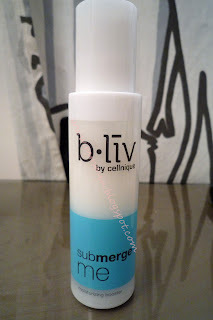 For those of you who are not familiar with B•liv, it is a sub brand of Cellnique (which specializes in repairing problem skin). The only difference I find is B•liv is geared to younger people and they offer products for those in that age group. To learn more about Cellnique, click here for Eki's review. 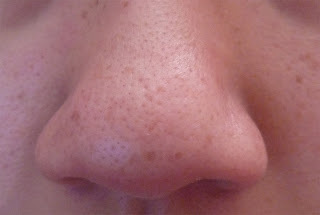 B•liv specializes in taking care of skin that has large pores, blemishes, blackheads, oily or dryness, whereas Cellnique deals with things such as discoloration, aging or sensitive skin. I think I could categorize my needs in between the 2 brands, I need a little bit of both. I will break down the review in 2 parts. This first one is my initial thoughts after the first 2 uses and then I will report back in about 2 weeks. I will also be using the products in the morning and night and the mask once a week. 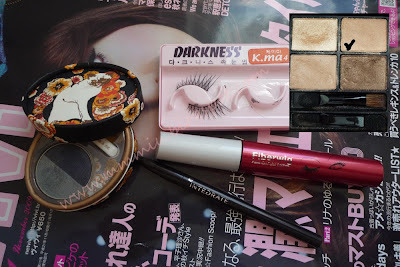 You can check out Ji's review of some of these products. For the sake of this review, I will stop using my Clarisonic, but I'll still be using my cleansing oil and Skinfood toner. Selina sent me 4 products to try out (plus a travel pouch and reusable bag). There are 2 products for blackheads/oily skin. 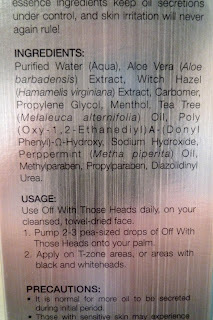 The cleanser is called Squeaky Clean and a serum called Off With Those Heads. 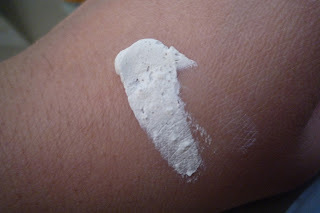 The serum is for the T-zone or any areas that have problems with white/black heads. It is also one of their best sellers. 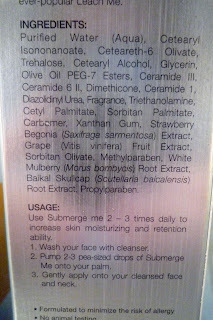 The blue label bottle is the moisturizer called Submerge Me, which is from their dry skin collection. The purple tube is the Glow and Shine from the large pores collection and it's a mask that helps reduce pore size, rejuvenates and exfoliates. The cleanser is green tinted and gel-like with a kind of citrus smell, it's hard to describe. 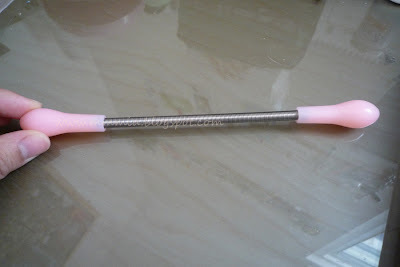 It has fine micro beads to help exfoliate and does not feel drying at all. There is 130mL ($25USD) of product and I use about 2 pea sized amount. 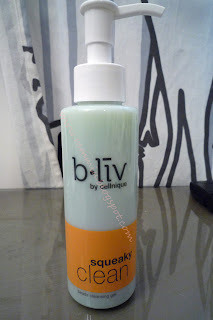 I was a bit irritated by the bottle though, it was very hard to get the product out easily, I had to press the pump so many times before the cleanser was dispensed. After cleansing, I use a toner then apply the Off With Those Heads serum ($63USD 45mL, also available in 30mL for $49USD). 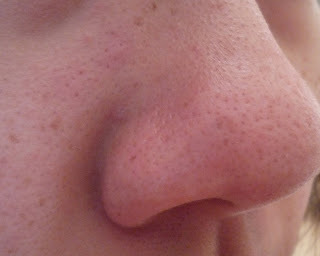 I mainly have white/black head problems on my T-zone, corner of my mouth (I know eww..) and a little bit off the sides of the bridge of my nose, so those are the areas I apply to. I haven't noticed any immediate results other than a cooling sensation which didn't last more than 5 minutes. Since I only need it on a small area of my face, a pea sized amount is sufficient. 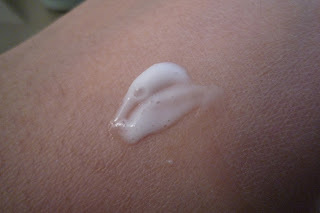 As for the moisturizer ($49USD for 45mL), it's a very light and slightly milky. I use 1-2 pea sizes which is plenty. 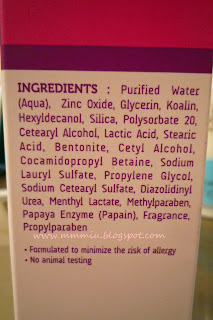 The best part of this moisturizer is it absorbs almost immediately and doesn't leave any residue or oily feeling. Remember that this is a moisturizer that's designed for dry skin so it might end up making those with oily skin even oiler. Besides that, the moisturizer says to help with anti-aging and brightening the skin. I was kinda surprised how small the mask was, considering the instructions said to put a thick layer all over your face and neck. I only put enough to cover on my cheeks, t-zone and a bit on my forehead and it already felt like I used half the tube ($25USD 50mL). You're supposed to leave it on for 5-10 minutes and it gave my skin a bit of a cooling sensation. However, after 5 minutes, my chin started so sting so I had to rinse it off. 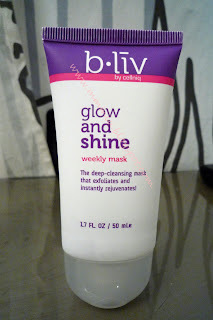 I like this mask because it doubles as an exfoliator (there are micro beads in the mask). After the time is up, you add a bit of water and massage it around your skin before rinsing. This is the only product that provided immediate results. Some of the crap on the side of my nose was pulled out with the mask and was sitting on top of my skin. If only I had a nose strip to yank it out, but I didn't, so I just scratched it off. I personally think these products are way out of my budget. But, if they actually show results then I will repurchase them when I can fit it into my budget. Since you've made it through my extensive review, Selina has provided an offer to the first 50 readers to try an Off With Those Heads sample. Simply e-mail fbfreesample@blivskin.com with the subject line mmmiu.blogspot.com. Be sure to include your full name and address. The sample takes 4-6 weeks for delivery. Enjoy! Offer ends a week from today! I'm sure most women out there have some sort of facial hair, whether it be super thin or peach fuzz to the bit more annoying ones, we would all like it to disappear. If you've ever tried threading or waxing I'm sure you know it stings or hurts. I've never tried bleaching so I don't know how that feels. Well rest assured, there is an alternative in removing facial fuzz. I can't remember where I first saw this neat little gadget, probably in some store in Hong Kong a while back but I never got around in purchasing it. 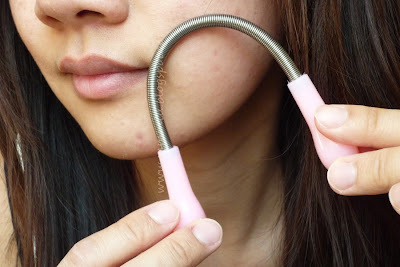 It's a steel spring facial hair remover which removes hair very similar to the threading method, though I think it doesn't hurt at all. I got it from Deal Extreme for less than $3 plus free shipping (buy here), so even if it didn't work out, it wasn't a huge waste of money. Hmm..where to start.. well it definitely works but it takes some practice to get it right. The spring needs to be bent into a U and you twist the handles outwards so the hairs will get trapped in the spring and thus be yanked out. 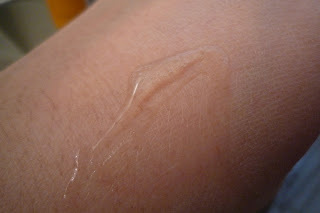 It's not as bad as you think, unless you have sensitive skin. I think it's similar to the feeling of threading but with less pain involved (it may vary from person to person). As easy as it is to use, I was a bit disappointed that it didn't pull all the fuzz out (but enough was gone), most likely because it's difficult to maneuver around my face. But I can still see this as a worthy investment, for those who don't have time to get waxed/threaded, to get the quick touch ups. And if you're curious, I tried this on my legs and it hurts. Cleaning is simple, just gently pull the spring apart, spritz some alcohol on and rinse. 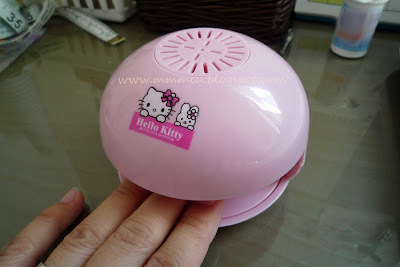 I also ordered a mini Hello Kitty nail dryer from Deal Extreme. Sometimes when the weather is too humid, it takes forever the polish to dry, or I'm just in a rush. It was only about $6 with free shipping. My second TESL course is starting tomorrow so I'm not sure when I'll have time to post again. It's such a beautiful day today but I'm stuck inside doing nothing but playing with my makeup. 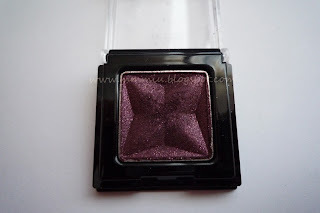 I have another long lost eyeshadow I got from my Tokyo trip, the Coffret D'or single eyeshadow in WN-33 that came out last spring/summer. It's a really deep purple shade that's meant for lining. 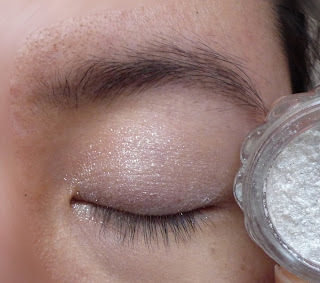 It has a lot of fine shimmers but doesn't really show up upon application. 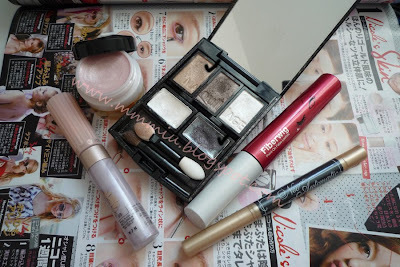 I picked it up as an impulse buy in Japan, I didn't want to leave empty handed from one of the drugstores. I've only used it once but didn't like it at the time due to the lack of staying power, but I had to give it a second chance. I chose this color because the model at the time was using it. I skipped out on the white shadow because I already had my Jill Stuart one. The shadow is a bit deeper than in the picture, there was too much light in my room. The first time I used this as a liner, the shadow went everywhere and didn't stay. 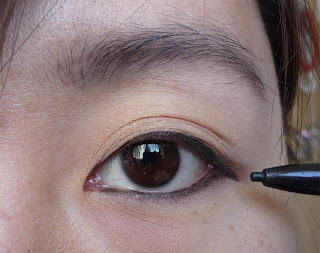 This time I used a black pencil liner as a base to help it stick and last longer. I made a pretty thick line with the shadow but it didn't appear too overwhelming when my eyes are opened. It's a nice change from using black all the time. It's Sunday, I get lazy and didn't do the base makeup nicely which explains the blurring. 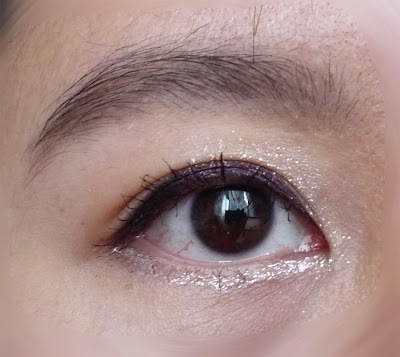 With the Coffret D'or Shining Eyeliner in WT-04 for more shimmer. So that's it for now! Still waiting for my Yes Style package. One of my items was discontinued so I had to call them to replace with something else and now I gotta wait all over again for the item to be in stock. I also ordered 5 China Glaze polishes from 8ty8beauty and it's almost been a month's wait. They're located in New York so I don't understand why it's still not here. I didn't realize that there was no tracking number until after I placed the order. They didn't e-mail me back to let me know until after it was sent out. $15 shipping and no tracking number? I thought UPS has one. Grrr... Has anyone else ordered from them? Glamourous March 2010, not a lot of makeup tutorials. Sweet (March) This issue was a bit on the boring side, didn't find any makeup tutorials. They have a list of top 35 makeup items though.